A team at Stanford University School of Medicine has used CRISPR/Cas9 technology to gain new insights into the genes that might represent new targets for the neurodegenerative disease amyotrophic lateral sclerosis (ALS). Led by Aaron Gitler, Ph.D., professor of genetics, and Michael Bassik, Ph.D., assistant professor of genetics, the team applied CRISPR/Cas9 knockout (KO) screens in human cells and in primary mouse neurons to identify genes that promote or prevent toxicity of the abnormal ALS protein aggregates that are believed to cause the death of neurons. They suggest such genes could potentially represent promising new drug targets for ALS. ALS causes progressive loss of motor neurons from the brain and spinal cord, which leads to muscle weakness, paralysis, and death, usually within 2 to 5 years. Mutations in one gene, C9orf72, are understood to represent the most common cause of ALS. The mutated gene contains a huge repeated section of bases, resulting in production of dipeptide-repeat proteins (DPRs) that clump together and are believed to be the main cause of toxicity and cell death. Mutations in C9orf72 are also the most common cause of the neurodegenerative disease frontotemporal dementia (FTD), which is the second most common cause of dementia in patients younger than 65 years of age. To try and understand the genetic basis of DPR toxicity, the team used CRISPR/Cas9 technology to carry out comprehensive genome-wide knockout screens in human cells. The aim was to identify genetic modifiers of C9orf72 DPR toxicity—effectively to try and find which genes might either promote or prevent the ability of DPR proteins to lead to cell death. 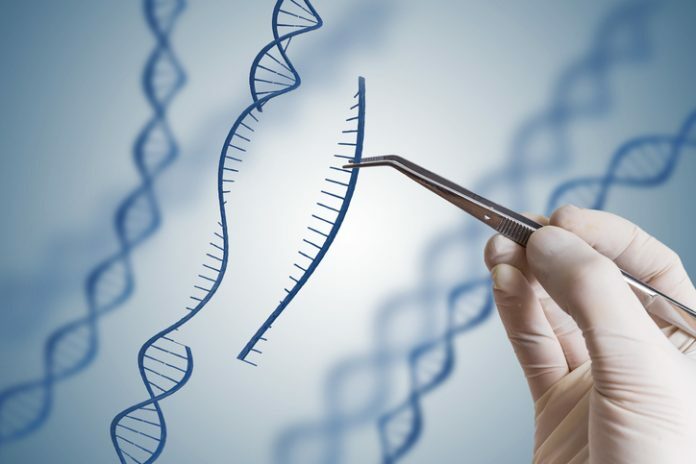 Rather than test each gene one at a time, genome-wide CRISPR knockout screens use libraries of single-guide RNAs (sgRNAs) to effectively knock out tens of thousands of human genes simultaneously. “We used a lentiviral sgRNA library comprising ten sgRNAs per gene and targeting ~20,500 human genes, along with ~10,000 negative-control sgRNAs,” they explain. To interpret the results, the researchers then used deep sequencing techniques to track the effect—whether protective, sensitizing, or neutral—of each sgRNA in a pooled population of the knockout cells. “That is, sgRNAs that protected cells from DPR toxicity were enriched, and those that sensitized cells were depleted form the pooled population of cells,” they continue. The aim was to identify genes that might either enhance or inhibit DPR toxicity. If knocking out one particular gene reduced the toxicity of the DPR repeats, then that gene may represent a drug target. The initial screens identified about 200 genes, each of which, when absent, either protected the cells from toxic DPRs or increased toxicity. Secondary screens in mouse primary cortical neurons were then used to validate the most promising protective genes. Among the top hits was a gene, known as RAB7A, which is involved in endosomal trafficking, and the endoplasmic reticulum (ER) protein Tmx2. Knocking out the Tmx2 gene in the primary mouse cortical neurons completely protected the cells from a synthetic cause of neurotoxicity that was otherwise almost always fatal to the cells. “We’re still in the early phases, but I think figuring out exactly what Tmx2 normally does in a cell is a good place to start—that would hint at what functions are disturbed when these toxic species kill the cell, and it could point to what pathways we should look into,” study team member Nicholas Kramer suggests. Drs. Gitler and Bassik are now using the same technology to help understand other causes of ALS and other neurological disorders, such as Hungington’s, Parkinson’s, and Alzheimer’s diseases, which involve toxic proteins. “I think it’s a really exciting application for CRISPR screens, and this is just the beginning,” Bassik states.